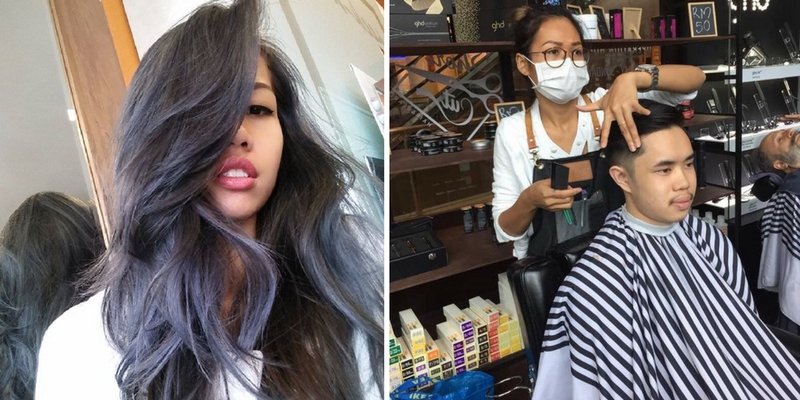 27-year-old Elpisolina Yahya’s Instagram profile reads “Malaysian with Indonesian roots, hairstylist”. Immediately, I’m drawn to her, with her subtle puns. Elpisolina, or as she is fondly known—Elpie—is a professional female barber and can be found most days of the week at Shortcut Barber Shah Alam. What makes her stand out though, is the fact that she’s the only female barber in the store and she’s more than just a one trick pony—she’s known to shave pretty sick beards too. We speak to Elpie to find out how she landed a job at the barbershop, what it’s like to be the only girl in the workplace, and above all, what being a professional female barber in Malaysia actually entails. 1. How long have you worked as a female barber for? I have had the passion for this for almost a decade but I started practising professionally 6 months ago. 2. What did you study in college in order to become a barber? I didn’t study for this field, I only took a few courses 9 years ago and still do the same to keep progressing in this industry. 3. Why did you decide to become a barber? I have always been very curious about this field and I found my passion in this so I chose this path. 4. What are your parents’ thoughts on you becoming a barber? My parents have always been very supportive of my decisions and they always help me achieve my passions and fulfill my ambitions in every way possible. 5. How long is your shift at work and do you work on weekends? I work from 10:30am till 7:30pm with a day off over the weekend. This is what I asked for in my interview and they happily assented to it. 6. What do you normally have to prepare before attending to a customer? I focus on providing them with proper consultation as per their features and physical attributes. Once they are satisfied with the ideas, I commence the haircut. 7. Do you provide services for shaving male beards as well? Yes, we do. Since, it’s the growing trend and beards are always in fashion. 8. How did you learn beard styling? Every barber has to go through classes that our company provides to see whether we are able to do it or not. It depends on the barber themselves and whether they are willing to take a risk in order to learn. 9. Do you have any female customers or do you only cut hair for male customers? I attend to both. I have a very mixed clientele. 10. Do you have any female colleagues? 11. Have you ever been teased for being a female barber? Not at all. I treat everyone professionally and people have been supportive. 12. Do you ever get compared to your male colleagues? I think that happens in every profession but I take it as a challenge and keep up with the profession. 13. How many customers do you get a day? It depends on the crowd for the day but I see a minimum of 8 customers and a maximum of 15 customers per day. 14. Has any customer ever rejected having their hair cut by you and what’s your reaction to that? I believe the customers are always right and have their own preferences set already. And whatever they prefer, I do not take it personally even if they don’t like my opinion or work. I try to keep learning from my peers to improve on skills I need to hone. 15. What’s your advice to those who want to become a female barber? Just do it! Because there is no difference between male and female barbers. You just need to master things you wish to learn and challenge yourself to be better. 16. What do you enjoy most about being a female barber? It’s always the learning. I always learn something new about different styles and it is also a challenge to myself to master different skills like beard styling too.